Fairfax County Health Department’s Andy Zima is a biologist by profession but for many he’s better known as MC Bugg-Z. 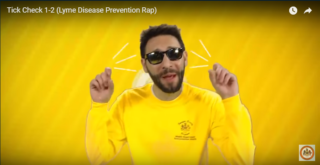 Andy’s latest rap video, Tick Check 1-2, cautions viewers to the dangers of Lyme disease and demonstrates the best ways to avoid being bitten in the first place; all done with humor and head-nodding beats. NatCapLyme has worked with Fairfax County Health Department over the years on various tick-borne disease initiatives such as the “Learning The Latest on Lyme” disease program, collaboration of literature and various public awareness events.